You may have heard a rumor my next sew along was Christmas memories.. and you were right! This is my 2nd year of Wednesday sew alongs, I'm having so much fun with it! Start date July 25, 2018. End date Nov 28, 2018. I weave memories in my Wednesday blocks. I have a title for the block and talk about that memory. The block does not LOOK like what I'm talking about. (ok.. sometimes it does, wink, but not usually). The GOAL is to sew easy blocks with fun fabric that you love! Good goal right? 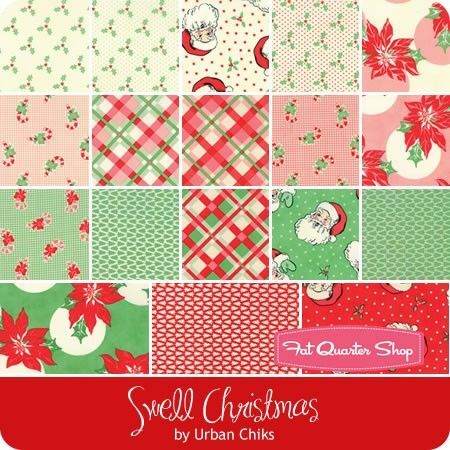 I'm using a FQ Bundle of Christmas Delivery by Riley Blake + a few 1/2 pieces a background & border. My supply list gives you what my working bundle is. Border Fabric I am using in Red, of course! ALL of Christmas Delivery line so you can pick up a few of your favorite 1/2 yd pieces to work with. You may also want to use a different fabric for the border. Swell in fun pink & light green. My friend Joanna of Fig Tree designed this yummy quilt, put it in a book and gave us bonus companion projects. The photography is incredible and I LOVE the blocks! It will be a sew along with the Fat Quarter shop. Once a month we'll sew blocks that are assigned. Not sure when the start date is as Joanna's fabric is not in yet. But you can see what it looks like and there are Jolly bars! I will be creating a page for Merry & Bright of all the blocks. And letting you know when the Christmas Figs starts! Are you going to sew Merry & Bright with me?